Oven-baked dinner with little prep! Comfort food doesn’t get much tastier or easier than this. 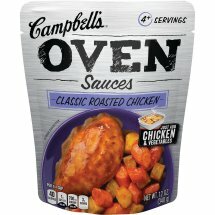 Ingredients: Chicken Stock, Modified Food Starch, Butter (Cream [Milk], Salt), Honey, Salt, Contains Less Than 2% Of: Sugar, Chablis Wine, Vegetables (Carrots, Onions, Celery), Caramel Color, Soy Lecithin, Spice, Corn Oil, Dehydrated Onions, Annatto Extract For Color, Flavoring, Yeast Extract, Potato Flour, Dehydrated Garlic, Maltodextrin, Smoked Paprika, Dehydrated Carrots.